Vivienne Malone Mayes earned the B.A. (1952) and M.A . (1954) in Mathematics at Fisk University. One of her teachers at Fisk was Dr. Evelyn Boyd Granville one of the first two African-American women to receive the Ph. D. in Mathematics. Her intense struggle to overcome racism in order to study mathematics at the University of Texas is told below. Vivienne Malone Mayes is the fifth African-American woman to receive a Ph. D. in Mathematics (University of Texas-Austin). She was the first black to serve on the executive committee of the Association for Women in Mathematics (AWM) and served on the Board of Directors of the National Association of Mathematicians (NAM). In 1966, Dr. Mayes became the first Black faculty member at Baylor University, the institution which had rejected her, with an explicit anti-black policy, as a student only five years previously. There she spent the rest of her teaching career, retiring because of ill-health in 1994. Vivienne Malone Mayes died June 9, 1995. Memorials can be sent to the Vivienne Lucille Malone-Mayes Scholarship Fund, c/o LaNelle McNamara, 501 Franklin Avenue, Suite 501, Waco, Texas 76701. Her dedication to the community at large was just as great. We mention below her anti-racist picketing; her articles situate her academic struggles within the broader anti-racist movement. She served on the Board of Directors for Goodwill Industries, the Board of Directors for Family Counseling and Children, the Texas State Advisory Council for Construction of Community Mental Health Centers, and the Board of Directors of Cerebral Palsy. 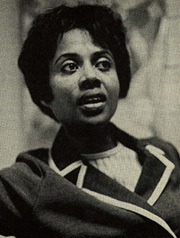 Vivienne Mayes went to University of Texas after her application for admission to graduate school at Baylor was rejected. But after graduating, she was the first black, male or female, to be hired at Baylor and put on the tenure track. In 1986 she celebrated her 20th year of teaching at Baylor, Ms Mayes says she has seen a lot of firsts and a lot of changes. "I never dreamed when I was a child that things would have changed so much when I was a young adult," she said. The civil rights movement was at its height during the years she was in graduate school, 1962-66, and she recalls joining picket lines to force restaurants and movie theaters to admit blacks. "Attitudes have changed so much," she said. "When I made a low grade, I felt I'd let down 11 million people. That's a heavy burden. Every professor stereotyped blacks by my performance. You felt like you had no choice but to excel." She chaired the math department at Paul Quinn College, operated by the African Methodist Episcopal Church, for seven years and at Bishop College for one year before deciding to take math courses in graduate school to "refresh herself." Her application was rejected at Baylor and she said she still has the letter she received that spelled out the university's segregation policy. "It was a blessing, really," she said. "If they'd accepted me at Baylor, I would have just taken a few courses and not pursued a doctorate." Baylor does not offer a doctorate in mathematics. The University of Texas, already required by federal law to desegregate, had to admit her. So she took summer courses at the University of Texas. "The first summer gave me the courage to continue full time, especially after I succeeded," she said. and became inspired to pursue a doctorate. After attending UT one summer and seeing others pursuing doctorates, she began to consider the idea. It was a lonely and stressful time for her. Vivienne had ability in abundance, but it took enormous courage and determination, as well, to succeed. Writing (1988) in the AWM Newsletter, speaking for all, she was to observe that "it took a faith in scholarship almost beyond measure to endure the stress of earning a Ph. D. degree as a black, female graduate student." But earn it she did, drawing on her vast reserves of courage and determination as well as on her undoubted abilities. Vivienne Malone's Ph.D. thesis, supervised by Dr. Don Edmonson, was entitled "A structure problem in asymptotic analysis." Part of this work was published in the Proceedings of the American Mathematical Society, v. 22 (1969) under a different title. (Later her research interests shifted to summability theory in which she published jointly with Dr. B. E. Rhoades.). Dr. Mayes' struggle did not end after the Ph.D. She was hired at Baylor University in 1966, and for years after, it took Federal invesigators to assure the Baylor U did not discrimnate against her. They stopped during the years of the Ronald Reagan presidency when funds for such investigations were cut. In 1971, the Baylor Student Congress elected Mayes Outstanding Faculty Memeber of the Year. Carswell, Catherine, BU math professor's life filled with firsts, Times-Herald [Waco], February 26, 1986; reprinted, AWM Newsletter, July/Aug 1986, pp.8-9. Kent, Nita Sue, Blacks at Baylor: after 20 years, The Baylor Line, November 1982, pp.9-13. Houston, Johnny, Spotlight on a mathematician, NAM Newsletter, 1995. Falconer, Etta and Lorch Lee, Vivienne Malone-Mayes in Memoriam, AWM Newsletter, November-December, 1995, 25, #6. Mayes, Vivienne, Black and Female , AWM Newsletter, v. 5, #6 (1975),pp. 4-6. Mayes, Vivienne, Lee Lorch at Fisk: A tribute , Amer Math Monthly, 83(1976), pp. 708-711. Mayes, Vivienne, Some steady state properties of [Int(f(t),t,0 tox)]/f(x), Proc Amer Math Soc, 22 (1969), 672-677. Mayes, Vivienne and Rhoades, B. E., Some properties of the Leininger generalized Hausdorf matrix, Houston J. Math. 6 (1980), 287-299.